Shaun Murphy has an impressive career and body of work that few other modern blues artists can match. Growing up in Detroit, she was recruited by Bob Seger for his band in the 1970s, and has been touring with him for nearly 40 years. Along the way she was with Little Feat for 15 years, as well having the opportunity to work with Eric Clapton in the studio and on tour back in the 1990s. Shaun has a huge list of A-list artists that she has worked with and she is an awesome rock singer, but her solo blues work is equally impressive. This is no surprise, as her influences include Big Mama Thornton, Koko Taylor, and Etta James. Murphy has recorded seven discs so far, including the very well received Ask for the Moon, which earned her two Blues Blast Music Awards and three Grammy nominations. 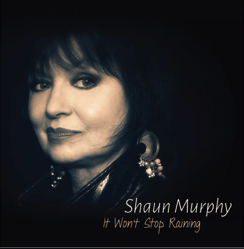 Shaun’s latest album, It Won’t Stop Raining, is a real corker with 11 blues tracks that are pretty well evenly divided between originals and covers. She recorded this project with her touring band, including Kenne Cramer and Shawn Starski on guitar, Larry Van Loon and John Wallum on keys, John Marcus on bass, and Tom DelRossi behind the drum kit. These pros hold a tight groove, and aced every track at Colemine Studios in Nashville, Tennessee. The title track is all about the mood, and “It Won’t Stop Raining,” is a haunting R&B ballad with pretty guitar arpeggios and a few layers of keyboards. The band uses key and dynamic changes to create a sense of tension that keeps things interesting until the end. Likewise, “Need You Love So Bad” allows Shaun to dig deep with its gospel-infuse vocals, but this time with the guitars getting a few of the leads. This is the oldest track on It Won’t Stop Raining, originally released by Little Willie John in 1956. Murphy included a pair of covers from E.G. Kight’s excellent 2011 album, Lip Service. “Happy with the One I Got Now” is a slow-grinding tune with the guitars and bass far forward in the mix, and Shaun does a wonderful job of phrasing the verses so that the drama builds naturally. And “That’s How a Woman Loves” is a lovely piece of rhythm and blues that lets Murphy take the center stage. She really shines on these heartfelt ballads, and her vocals are stunning, to say the least. There are no surprises with Shaun Murphy’s It Won’t Stop Raining, as her fans expect her to provide a first-rate performance, and she does not disappoint (as always). If you are looking for blues that is sung with powerful passion, you need look no further – this is the real deal, and you should pick up a copy of your own!